Connect as many of our High Power Solar Cells as desired to produce just about any voltage or current to power anything you can run on a battery. 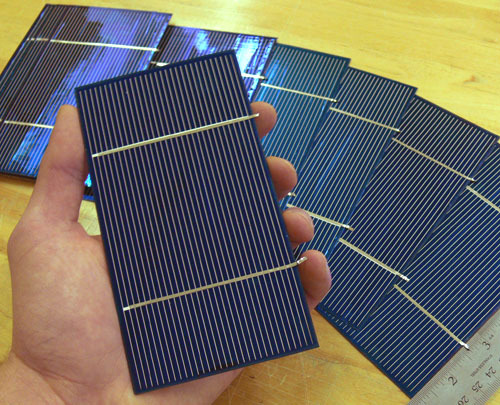 These are brand new, American made multi-crystalline 3" x 6" Solar Cells. They are quality 'A grade', Not recycled , rejects or seconds. They are prime High Power Solar Cells. Our cells now have 2 small solder tabs protruding from the side. This makes soldering to the front grid a snap. Simply solder your negative wire to either one of the small tabs that are connected to the silver strips on the front, then solder your positive wire to any one of the 6 small solder pads on the cell's back. Connect as many cells together as you like to increase voltage or current (amps). Wire the cells in series to get more voltage, or in parallel to get more current. Power just about anything. This is as 'green' as you can get. 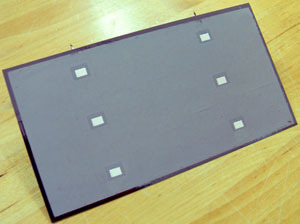 Note: All Solar Cells are thin and very fragile. They must be handled with care or they will chip & crack. It is normal for some new cells to have small edge chips. These are not defects and do not affect performance. Cell color may vary somewhat from the image above, but it also has no affect on performance. Also note that you can break or cut these cells into whatever size you like. They will still produce power no matter how small you make them - the larger the piece, the more the power.